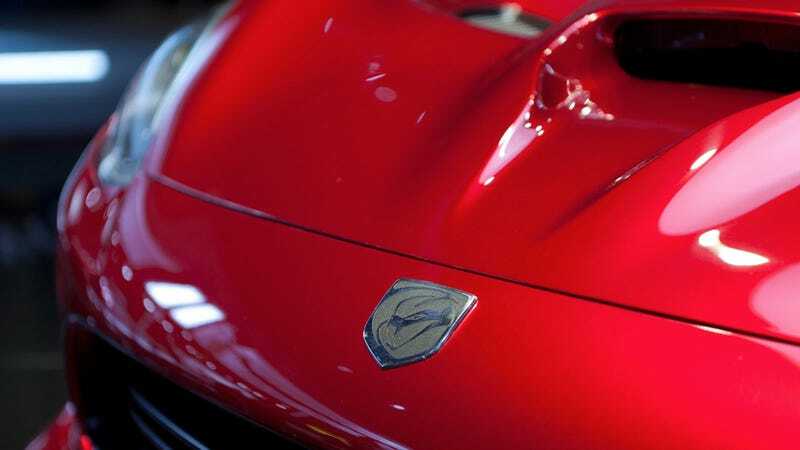 All I've wanted to do all day is stare at the 2013 SRT Viper. To lick its shimmering curves and caress its glorious carbon fiber details. But I'm busy and you're not here. That's what we've sent our photographer to capture every fapworthy detail. Scoot your chair closer to your desk. Dim your lights. Set your chat client to "away" and enjoy. I'm sitting here in a basement banging on keys to bring you the most important news from the New York Auto Show. Thankfully, our photographer and former Ska-Ka-Doodle-Doo tenor sax player Ian Merritt was more than willing to spend some time with the SRT Viper. This isn't a Ferrari with Viper skin and a Fiat engine. This is the same Viper legions of enthusiasts — and just a few Affliction-brand clothing owners — fell in love with. It's just benefited from a touch of experience from their friends in Maranello. I'd like to touch it in my own experienced way. Coax open the almost glistening carbon fiber clamshell hood and there sits a refined version of 8.4-liter V10. A pearl of an engine pulsating with 640 horsepower and 600 lb-ft of torque. And someone's been on a diet. Adding aluminum. Dropping 100 pounds. Keeping its body tight and sleek with a .365 drag coefficient and 50% stiffer hardened steel frame. The new SRT Viper is naughtier but safer, with a federally mandated suite of electronic nannies and a bit of launch control. But you've never had trouble launching anything, have you? I'm feeling a launch of my own right now. Rubbers? Only the best. Pirelli P Zeros that are wider than ever. As Missy Elliot once said "Wrap it up, before you strap it up." And when it's time to stop the massive four-piston Brembos bring the party to an end. But the party never ends with you, does it? Call it a Viper. Or the Mr. 2013 SRT Viper if you're nasty.